Variegated Agaves have been around for a long time. They're not the new kid on the block. But they're still very impressive - and the variations are amazing. Whether these are varieties or cultivars or whatever, it doesn't make too much difference to me. I just like them. This first one was labeled "var. striata" when we first got it's parent - at least 30 years ago. And the next one is generally called "marginata". We have a large one we're going to plant out this summer and see if it survives our winter next year. Every year at about this time of the year, this old grafted crest is among the first to bloom (originally from the late László Nyerges at Desert Nursery in Deming, NM). It's a wonderful and dependable Rebutia minuscula crest. The normal plant also goes by the common name of "Red Crown" cactus and is from northern Argentina. This was one of the first cacti we grew some 40 years ago. As an aside, we very much miss our annual visits and conversations with Laszlo when we would drop by his nursery on Copper Street in Deming. It was always worth the visit. Spring in the greenhouses continues to blossom. In sharp contrast to yesterday's more delicate image is this sharply impressive Oroya peruviana (syn. : Oroya neoperuviana). Native to central Peru at elevations of 3000-4200 meters (ca. 9,800-14,000 ft.). Returning to a classic tonight: Mammillaria aureilanata. I look forward to it's flowers every year, but even without the flowers the plant is fantastic all in its own! Known to most of us as simply E. delaetii, this is certainly a distinctive looking "hedgehog" cactus. The long, curly central spines are outstanding. If you do a Google search on "Caralluma" you get a who bunch of links to powdered Caralluma for dieting. Well...they aren't going to get our plants! These plants are just too nice to grind up and pulverize. And the pictures tend to ignore the plant for the flowers. The flowers are fantastic, of course...but to me, the plant is enough. In the right light they almost glow. This is Caralluma acutangula. Not much to look at yet, but signs of growth as the bulbs come out of their dormancy. The next one's a little farther along and you can see the flower buds developing. Ah, yes, Spring has sprung! The cultivar name on this one refers to the person's name - Grimm - and not to be being particularly "grim". In fact it's bright and pleasant cultivar which is currently showing off it's flowers. Nothing like going from one side of the cactus spectrum to the other; if we were just casual observers it would be hard to believe that this Astrophytum and the previously posted Epi were both from the same family of plants. The very formal geometric patterns of the Astrophytum are a total contrast to the graceful lines of the Epi, but each is beautiful in its own way. This particular example is four sided - quadricostatum - and they are often marketed as a variety in themselves. But many of them will add another rib or two with time and it's clear that this is not a stable reality of the species. But they do sometimes stay four-sided as they grow older, making them very distinctive. The 'Onzuka' is a cultivar which emphasizes the dots and sometimes very distinctive patterns of dots. We made it back in one piece with a couple of pleasant stops along the way. We're having a good stretch of nice weather, so the snow in the Cascades wasn't an issue. There's still plenty up there but the roads were clear. Not a large bloomer, but quite nice. Road Trip and Drunkard's Dream - Oops! not a good combination! Haven't had time to do much with photos today. We're heading out on a one day road trip tomorrow to Central Oregon with stops at Mt. Hood, the Warm Springs Indian Reservation, Madras, Redmond, Sisters and then back across the Cascade Mountains (through the Santiam Pass), up through the Willamette Valley and home. The main reason for the trip is to take care of some business at Warm Springs (our younger son - adopted - is Arapaho and Warm Springs). Recently there have been a lot of plants being distributed at home and garden shows and through respected nurseries that aren't what they are labeled to be. Yes, I know. Why am I surprised? We all know it happens all the time. It's just that in this case they're so persistent. The top photo here is E. 'Topsy-Turvy'. 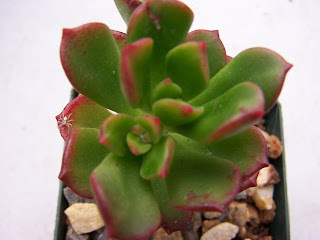 This is widely being sold as E. 'Lola', which is the second plant pictured. Significantly different plants. I understand labels being switched or lost and it isn't that we haven't misidentified a plant at times, but this is intentional. I've personally told vendors on several occasions and they either look perplexed as to why I care or they say "really?...we'll have to take care of that." Then, a year later, they're still selling them with the wrong name. I know some people don't care about the correct name; so be it. But these are grower/vendors, and they should care. Another one of the Aloes is blooming, Aloe fragilis. A small clumping species from northeastern Madagascar, it eventually forms large mats of 3" rosettes. They grow on steep rock faces along the Indian Ocean. Proof positive: Spring is coming! The "Snowdrops" are popping up everywhere. Not long before the tulips bloom. We feel for those of you in the mid-Atlantic area of the country who got as much as 3 feet of snow yesterday; but we unabashedly celebrate the really great weather we've been blessed with. Time to start planting those tomato seeds so we can set them out at the right time. Originally labeled Rhipsalis crispimarginata, this plant - native to Brazil (southern Bahia, Espirito Santo, Rio de Janeiro and Sao Paulo) - has decided to put out it's blooms. We like this plant year 'round because its foliage is so nice, but the tiny little Rhipsalis flowers are an added bonus. Care is easy. Though they generally don't like to go totally dry, our Epiphyllum and Rhipsalis plants tend to be forgotten among all the desert plants. But even with this benign neglect, they do quite well. I did get out into the greenhouses to take some photos today and yesterday. Nothing flamboyant yet, but this is one of those small, delicate little haworthias which don't always get the attention it should. We've come to like them a lot and highly recommend them. Haworthia herbacea. Also, like many haworthias, it has a host of synonyms: Haworthia translucens ssp. translucens, Haworthia arachnoidea var. translucens, Haworthia atrovirens, Haworthia luteorosea, Haworthia pallida, Haworthia papillosa var. semipapillosa, Haworthia pumila, Haworthia translucens, Apicra atrovirens, Catevala atroviridis, Haworthia aegrota, Haworthia papillosa, Haworthia submaculata, Aloe arachnoidea var. pellucens, Haworthia pellucens, Aloe arachnoidea var. pumila, Aloe papillosa, Aloe pumila, Aloe arachnoidea var. translucens, Apicra translucens, Aloe atrovirens, Aloe bradlyana, Aloe herbacea, Aloe pallida, Aloe translucens, Aloe papillosa var. semipapillosa. Hey, let's just stick with H. herbacea! I was sorting through the photo archives and came upon this photo of Echeveria multicaulis ("Copper Roses") and noticed its little friend on one of the leaves. These of course are good spiders, unlike the bad spiders called "red spider mites", which aren't spiders at all...which is all very confusing to the beginner. All of which reminds me of the time when we had a walk-in plant nursery and we put up a fake spider for Halloween. Of course the first customer to come to the greenhouse that day was arachnophobic. Never saw her again! Whenever we make it to the local bookstore, you can always find me checking if they have any new books on succulents. Usually they don't. But once in a while I do. I did the other day. It was in the "bargains" section. That's usually a give away. It was about interior designing with plants...and they really liked succulents. But let's get real: a planter full of Echeverias on the coffee table in the living area, with no access to bright light? This just won't work. Echeverias don't do well as house plants. The same with the "other" hens and chicks, Sempervivums. There an alpine plant and they like the outdoors. Indoors they begin to look like those scraggly little plants I observe in the local grocery store! Which reminds me. Last year I did a little experiment. Every time I observed a succulent plant covered with mealy bugs or (ugh!) scale, or collapsed in a mush of rot, I would leave a small note indicating the problem. Then I would wait and observe. On average it took 5 days to a week before anyone took note. Gives you pause doesn't it?